If you need a place to study, the WSU Libraries can help! In addition to reservable Group Study Rooms in Terrell and Group Study Rooms in Owen, the Libraries have several areas set up for group and individual study. Lockers are also available for public use. Keep in mind that different libraries have different hours, so check the library's hours. In the Holland/Terrell Libraries, check out the Art Lounge on the second floor of Holland, where you can study surrounded by artwork. Spaces for studying are also available in the Micro Lounge, a brightly-lit study space on the first floor in the Microforms room; in the Retro Lounge on Holland's first floor; and in the Quiet Study Lounge, located immediately inside the Terrell library main entrance. If you are in the Owen Science and Engineering Library, the third floor maps room is both quiet and comfortable. Other favorite spots include the comfy couches and chairs against the south windows on sixth floor, and the tree-shaded nook just to the east of the first floor entrance. There are private and group study rooms (with whiteboards) on fourth through sixth floors for those wanting more private spaces. Owen also has laptops available. 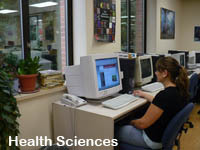 In Wegner Hall's Animal Health Library, there are study spaces for 80 students and 17 computers for access to ebooks, journals, databases, and internet resources.